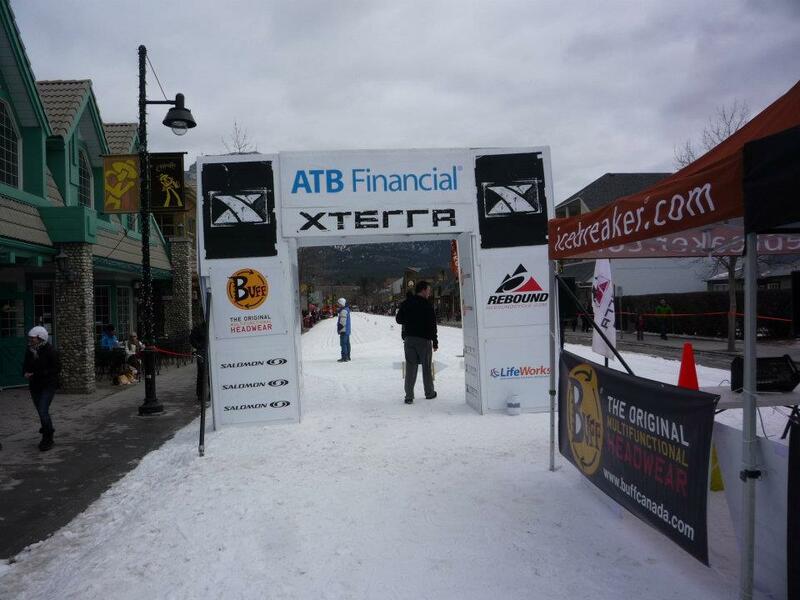 Xterra Winter Triathlon Race Report | Move fast. Think slow. Today was a super fun break from the regular winter volume training to compete in one of the shortest races I’ve done in a long time! At the second annual Xterra Winter Triathlon in Canmore I got to experience another one of Tony’s (www.smithevents.ca) amazingly run events! The race began with a 500m swim in the Canmore Recreation Centre, a first experience for me as it was my first swim in a pool in a triathlon. The slowest swimmers started first, with a maximum of 4 swimmers in one lane at a time. It was a sold out race so while the first swimmers began at 2pm, I finally got to hop in the water over 45 minutes later after a short warm-up in the 10 metre long kiddie pool corner. Swimming 500m as fast as I could was a burner and I went out a little too hard! With a goal of swimming faster than 7:30 I was happy to hop out of the pool 7 minutes and 27 seconds later. After transitioning into run clothes and putting on run shoes on the way out the door, we ran an icy 3.5km on the gravel path system that circles the north side of the town. Those that chose to run in studded shoes or with Yaktrax today (not I :() were the smart ones! For the few short, exposed gravel stretches in the run it was possible to get some leg speed going but otherwise it was dicey balance of running fast, small steps to stay upright especially through a few of the corners. 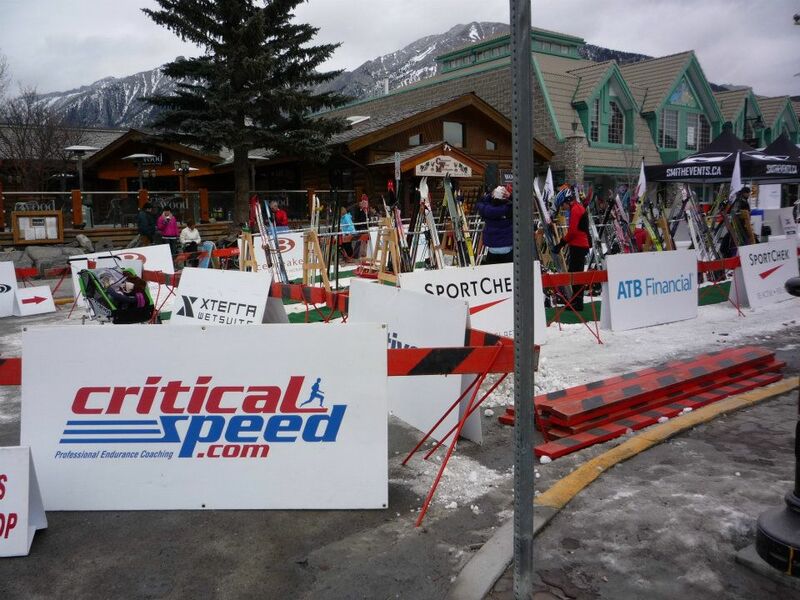 Then for the most exciting part of the race – transitioning to cross-country skiing for 5 laps of main street in Canmore for a total of 3km. The snow was laid down on the Main Street as part of the 10-day winter carnival. Since it was only my second ski of the season I was a little wobbly at first but once I found my two-skate rhythm I was having way too much fun, and wanted to keep going when my 5 laps were up! While I unfortunately had to leave with the family before the awards the rumour is I was the second women but I will have to confirm that. It was so short and fast, I think my transitions may have taken as long as the racing, ha! Either way, it was a lot of fun on a beautiful, perfect 2 degree winter day and would recommend this event to everyone! It was a total blast! This entry was posted in Race Reports and tagged race report, Xterra triathlon by Danelle Kabush. Bookmark the permalink.